Sue on taking the Ben Nevis challenge. 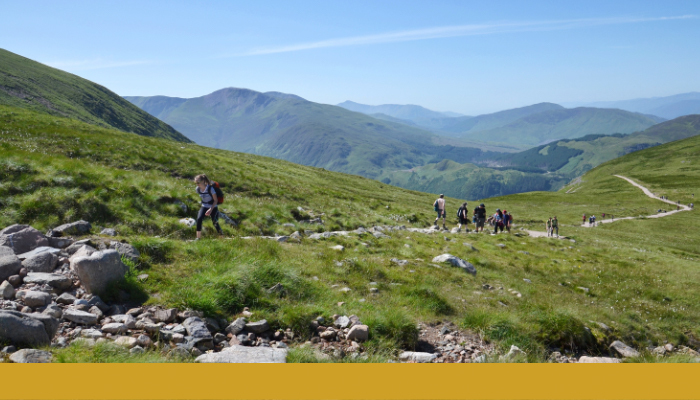 I was reading my RNIB newsletter when I came across an article about the Ben Nevis challenge. Having had some experience of fell walking in the Lake District, I thought ‘I quite fancy having a go at that’. It wasn’t without its challenges; I don’t think either my guide Graham or I had realised quite how rocky it was going to be, but along with Sheena, Lizzi and Phil we made a fantastic little team. Eventually we made it to the top. We were behind schedule, but we still did it; I’ll remember it for the rest of my life. The whole experience was unbelievable. People were wonderful and so willing to help wherever I needed it. As someone with sight loss, when doing any sort of activity you have to have complete trust and faith in the people guiding you and leading the walk. I had this in Lizzi, Sheena, Graham and Phil, even though I’d known them for less than 24 hours. Take up a fundraising challenge and raise cash for RNIB.